As Africa is such a huge and diverse continent, so too is its scope for decorating opportunities within the home. This article will focus on what most people think of when they think of African decorating; in terms of the kind of room you would like to retire to after being on safari. There are of course many more opportunities for African inspired decorating, by focusing on countries within it - Egyptian and Moroccan styles for example, are hugely accessible and popular decorating styles for the home in their own right. Walls should be painted in warm colors of sand, terracotta, and dark orange. Brown can be used in places, but is best restricted to a feature wall. If you can incorporate some kind of texture onto the walls with the use of stucco paints or using a cracked walls faux paint technique then this will add to the authenticity. You can also decorate the walls using natural materials, like rushmats, bamboo or wood panels. Color within the room itself should always be natural colors, apart from the odd accent of an animal print, or African painting. Patterns are usually, off-beat geometric designs, using zigzags, triangles, and dots. Animal prints should be used on cushions, table mats and wall-hangings, but not as rugs or as large expanses for drapes or sofas. 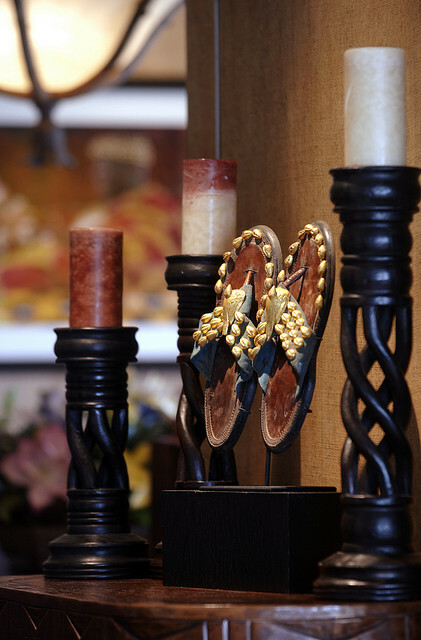 Artifacts made of dark wood, metal, and basket-weave and are used as finishing touches in an African inspired room. Drapes are simple and floor-length and hung on dark wooden poles. As walls of African decorated rooms are painted plain you need to add some interest to the walls, which can be done in a number of ways. African art is very colorful, and heavily relies on form and shape, rather than small details. Primary colors are generally used, with spaces defined with thick black outlines, and white forms interspersed within it - the designs are very tribal in influence. As the picture here shows, geometric forms are used, making it an ideal option for the modern home, as the look is very striking and contemporary. Paint directly onto the walls, onto wood, or an off-shape canvas like a cut off triangle shape. Another option for added African style is decorating the walls with a fabric wall-hanging of an animal print, or a colorful flat basket-weave design, that might incorporate wooden beads. 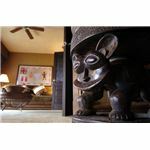 If you want to go all-out tribal, then replica spears and shields can be hung on the walls for a true safari style room. 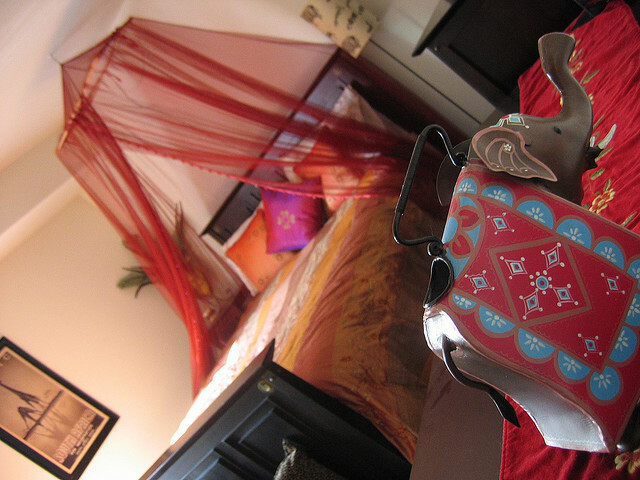 Replica artifacts really help bring an African themed-room together. Dark wooden artifacts of elongated faces/masks on a stand, as well as mini tom-tom drums, colorful hand-woven baskets are an easy way to add African style. Try grouping these artifacts together, in odd numbers on a side table for the most impact. African Animal prints, such as zebra and giraffe can be used as placemats in an African inspired dining room, cushions in a living room, or as a mini throw/bedspread in an African-look bedroom. To add African style to a bedroom instantly, then add a simply canopy over the bed, much like a mosquito net. To cool down after a hot day on safari what better than to relax under a ceiling fan - dark colors work best. 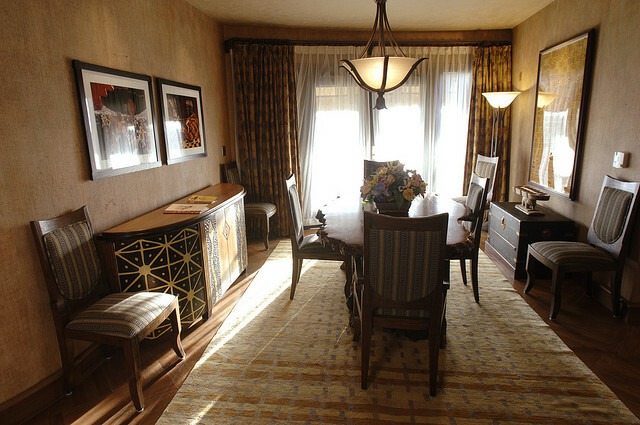 Naturally the floors in African inspired rooms are very plain, so add color and detail using a rug, of tribal design. Plants really help to bring a room alive, almost bringing the jungle inside. It also adds a terrific accent to the neutral colors that dominate the decoration in African rooms. The best plants to look for are those with big leaves, like rubber plants, cheese plants, banana plants, and the highly appropriate elephant ear plant. Using all, or a selection of these ideas for African decorating will create not only an authentic "on safari" feel to your home, but also a wonderfully warm and cozy place to relax.